The U.S. government has been accused of a long-running, massive cover-up of a secret agency that solely deals with evidence and information about UFOs and alien visitors, and the claim comes from several high-ranking military officers and a British secret agent who all gathered here over the weekend. Among the audience of some 200 at the Smithsonian’s National Atomic Testing Museum were my UFO expert pal Lee Spiegel from AOL/Huffington Post and his Sci-Fi TV channel friends Ben McGee of “Chasing UFOs,” Ben Hansen from “Fact or Faked” and “Poltergeist” author Mark Victor. 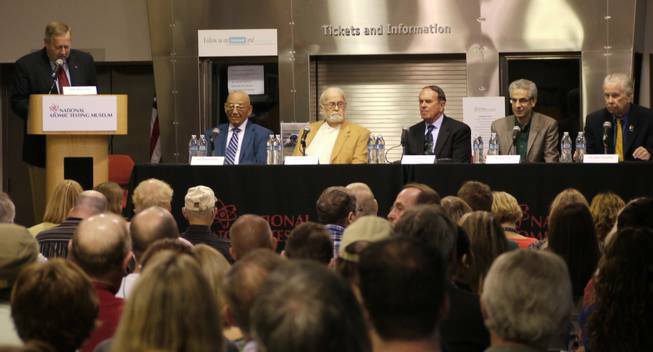 I joined the group the night before the panel at a dinner at the museum, which houses the controversial Area 51 exhibit. I was impressed with their reputations, military standings and convictions on the subject sometimes scoffed and scorned by others. These were distinguished and serious-thinking military men with their own UFO experiences. Col. Halt himself when a U.K. military base commander at RAF Bentwater was one of numerous eyewitnesses to several UFOs. “I’ve heard many people say that it’s time for the government to appoint an agency to investigate,” he said. “Folks, there is an agency, a very close-held, compartmentalized agency, that’s been investigating this for years, and there’s a very active role played by many of our intelligence agencies that probably don’t even know the details of what happens once they collect the data and forward it. “In the last couple of years, the British have released a ton of information, but has anybody ever seen what their conclusions were or heard anything about Bentwater officially? When the documents were released, the timeframe when I was involved in the incident is missing. Nothing else is missing.” The colonel says he’s kept in a lockbox copies of tapes, notes and diaries from the experience. Retired Army Col. John Alexander. Air Force Col. Bill Coleman, who was former chief spokesman for Project Blue Book, told of his own riveting encounter with a UFO while piloting a B-25 bomber. You can read that incredible story in Lee’s report. British Agent Nick Pope, who noted that he had all British UFO publications sent to P.O. Box 007 in London, said that although there was no “spaceship in a hangar” smoking gun, the lecture was the real deal. “This is an insight from people who have looked at this mysterious and infuriating subject for the government. Lee also has posted a video of CBS’ Mike Wallace (“60 Minutes”) grilling and getting confirmation from Marine Major Donald Keyhoe about flying saucers from outer space being witnessed by more than 800 pilots. Wonder What “Nick POPE” had to Say On the Matter as Lead Speaker? Yes, it is hard to believe that these high position holders some with decorations would come out supporting the existance of aliens & UFOs if they were NOT indeed real, all it would do for them is bring them ridicule so one must give their testament the merit it deserves. I just hope that when first contact happens (if it hasn’t already) the right people meet them because I’m convinced that some would respond by attacking, which would be a very stupid & volitile thing to do. I hope I’m still around when it’s made public or uncovered whichever it is.